I first heard about the new Parallels beta here on Dan’s vox account. It’s really incredible. It includes a couple cool new features, one being “Coherence” which lets you run windows intermingled with your mac. See how I have a windows taskbar below my apple menu at the top? That’s Coherence running. When it comes to computers, I’ve long been a tool agnostic. I started on Windows but I used to run emulators to test out how sites looked on a linux box or an old mac. I used both a mac and windows machine simultaneously for the past four years so I could use the best applications of each platform. At first it was two computers side-by-side, then I got to share a single keyboard and mouse. 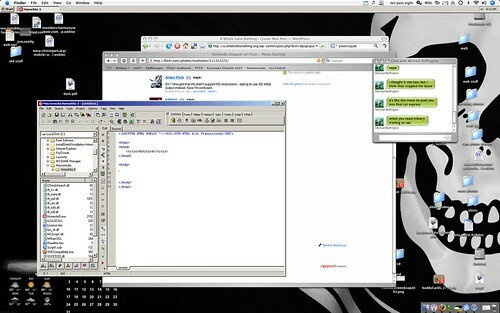 Eventually, I got two virtual desktops running on a single intel Mac with Parallels. With the latest Parallels beta, I can now run just the one or two windows apps I need directly on my mac desktop. After many years of tinkering, I’ve finally got the ultimate web testing platform. I can edit files in a window, then just hit refresh on safari, firefox, and IE6 all next to each other to see how each browser responds to changes. If you develop websites and have to worry about CSS differences between platforms and browsers, this is the killer tool for you: Parallels and an Intel Mac. I was hoping Parallels would support this. Fantastic. Also, you can really compare interfaces and GUI design on PC vs Mac apps by running them like this. I’m just a huge fan of being able to boot your Boot Camp partition. I’ve been running two windows installations for awhile, one in BC for anything that needs 3d acceleration, and then one in Parallels for browser testing and website compatibility stuff. This update just saved me well over 6GB in space on my already small 80GB MacBook Pro HD. Space I really need, so I’m a happy camper. I was a bit worried about Parallels and that they might possible become too big too fast and just let their software stagnate, but I’m pleasantly surprised to see that even as their popularity grows, they have not stopped innovating. It has to cost them quite a bit to keep it up, with the amount of support that’s probably pouring in there all the time, so props to them. Next, if they can figure out how to add 3d acceleration graphics card support, this really will be the ultimate package for everything windows on a Mac. I love the new version. I just wish the Linux support was better, since I use it to run both Windows and Linux on my MacBookPro. Lack of mouse synchronization in Linux is especially annoying. How RAM hungry is this? I was thinking of getting one of the new MacBookPros. Going up to 3GB is insanely expensive. Do you think it would be happy with 2GB? It worked fine on my Mac Pro with 1Gb of RAM running XP (which only takes up 256Mb of RAM), but I tried to run Vista once (taking the minimum 512Mb of RAM) and everything ground to a halt, performance-wise. I upped my Mac Pro to 2Gb and XP runs wonderfully 24/7 and Vista is alright. I’ve got a measily 1GB right now (which seemed like a metric fuckton when I upgraded from a 1st gen 12″ G4) and XP chokes my system up something fierce. So that’s a good lower bound for you.